Next generation sequencing (NGS) is a method of non-Sanger-based high throughput DNA sequencing in which millions or even billions of DNA strands can be sequenced in parallel. 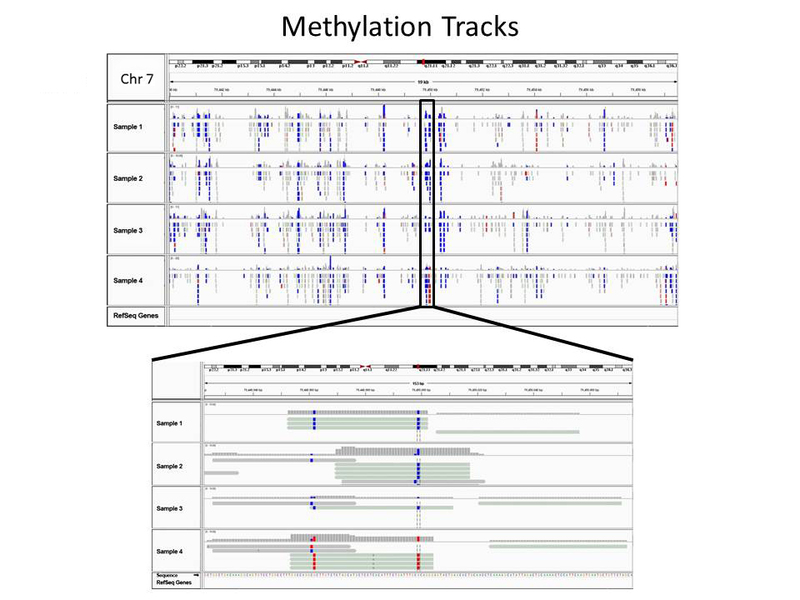 Epigenetic researchers utilize NGS as an important tool to gain detailed and comprehensive insight into epigenetic modifications of genomes belonging to numerous species and from many different cell types. NGS minimizes the need for fragment-cloning methods often used in Sanger sequencing of genomes and yields significantly more throughput. NGS technologies have increased data output volumes and lowered the cost of DNA sequencing beyond what is possible with standard dye-terminator methods. This has led to a significant advancement of understanding of several epigenetic mechanisms, namely genome-wide DNA methylation and protein-DNA interaction. Modern technologies that are used for NGS include Illumina, Ion Torrent, Roche 454, SOLiD, and Pacific Biosciences. NGS can be used for genome-wide DNA methylation identification which primarily includes whole genome bisulfite sequencing (WGBS), reduced representation bisulfite sequencing (RRBS), and methylated DNA immunoprecipitation sequencing (MeDIP-Seq). Other NGS areas of investigation include genome-wide chromatin or histone modification analysis which relies on chromatin immunoprecipitation sequencing (ChIP-Seq). Researchers can identify whether a specific protein, transcription factor, or histone binds to specific sequences of a gene on a genome-wide level. Genome-wide chromatin accessibility detection can also be accomplished using NGS methods such as ATAC-Seq, MNase-Seq, and DNase-Seq, among others. Epigenetic scientists use NGS data and analysis to identify reliable markers and contribute to the development of targeted therapies. EpiGentek offers many inexpensive solutions for next-generation sequencing including full package kits to conveniently construct high quality DNA libraries from low quantity or difficult samples.